Ever look at an NFL Draft guide and not know where to start? For those who were asking about this year's NFL Draft preview guide, we took your suggestions and turned up the volume 10x more with this new eBook. 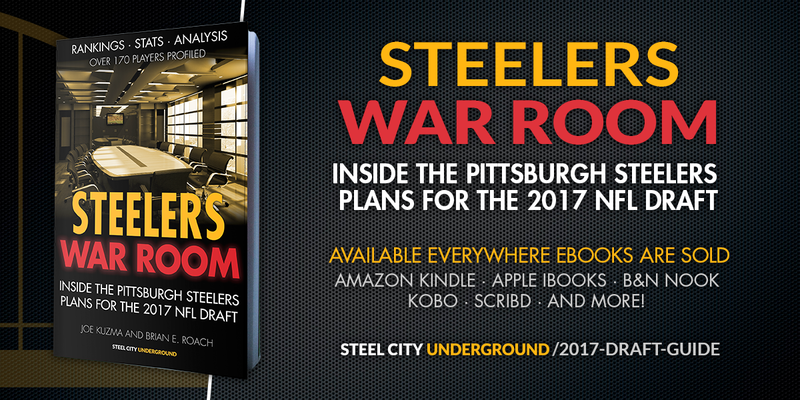 Last year we had produced a similar Steel City Underground "Draft Preview" which detailed the each official visit a prospect had with the Steelers. Each NFL team is permitted 30 individual visits. However, with the majority of those visits following various combines and pro days, we would never have enough time to publish this book. Therefore we decided to profile players who interviewed or met with members of the Steelers staff at the NFL Scouting Combine, Senior Bowl and East-West Shrine Game. In many cases, those interviews overlap with official visits, therefore, the guide has expanded drastically from the 30 prospect profiled last year. While every draft-eligible player isn't outlined in this publication, we went above and beyond the initial meetings and interviews at those three events: over 170 NFL hopefuls are detailed within these pages complete with stats, analytics, rankings and detailed analysis on the Steelers draft plans. For those interested in purchasing, the guide is available for Amazon Kindle (Kindle devices or phone/tablet Kindle apps) and also on Apple's iBookstore plus everywhere eBooks are sold. We spent countless hours putting together the statistics and information, and priced it so we didn't kill ourselves, but it won't cost you much more than a cup of coffee. So we hope you find it as a useful source for the Steelers draft prospects and think it will come in handy as a Draft Day reference. Thank you as always for supporting Steel City Underground.